Lydia Sewell (M.M. Performance, 2017) is a Kiwi-American violinist from Madison, WI. In a series of "offline events" offered through online music conservatory Discover Melody, she has recently completed a tour of China, beginning in Beijing and thravelling through Shanghai, Hangzhou, Wuxi, and Shenzhen. Currently an Associate Member of the Civic Orchestra of Chicago, she has played with the Pittsburgh Ballet, Wisconsin Chamber Orchestra, Wheeling Symphony, Johnstown Symphony, and Westmoreland Symphony Orchestras. 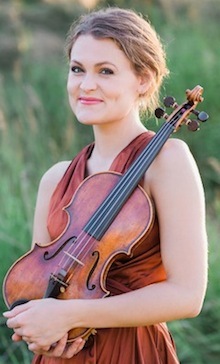 Ms. Sewell made her solo debut in 2009 with the Wisconsin Youth Symphony Orchestra, performing the Barber Concerto as a winner of their concerto competition. She recently made her West Coast concert debut performing a commissioned work by Townsend Losey with the Los Angeles based choral ensemble, Ensoma. In 2017, Ms. Sewell received her Masters in Violin Performance on full scholarship from Duquesne University in Pittsburgh, where she served as both Concertmaster and Principal Second. In 2011, she received her Bachelors in Violin Performance from Azusa Pacific University in Los Angeles, where she served as Concertmaster for the University Choir and Orchestra and Principal Second in the APU symphony. Ms. Sewell has studied with Gene Purdue, Alex Russell, Lorenz Gamma, and Rachel and Charles Stegeman, and has had master classes with Ilya Kaler, Hagai Shaham, Soh-Hyun Altino, Henning Kraggerud, and Rachel Barton Pine. As a non-classical violinist, Ms. Sewell is experienced in many styles, from rock to Celtic and world music. She has recorded and performed with a number of indie bands in Los Angeles. In 2012, she joined the band Branches for their concert tour up the West Coast, and earlier that year played for the alternative indie bands Sleeping At Last and Sucré at the ABC and MTV Networks. She has also performed with Mark Wood at the Gathering on the Green concert series in Mequon, WI, as well as with the Trans-Siberian Orchestra during their East Coast tour of The Ghost of Christmas Eve. Ms. Sewell has studied Scottish fiddling with David Gardner and Melinda Crawford at the Strathgheny School of Scottish Fiddling in New Wilmington, PA. In 2013, she played alongside Indian Carnatic musical artist N. Muralikrishnan "NMK" in Walt Disney Concert Hall as part of the sixth annual Los Angeles International Music Festival. Ms. Sewell's interests extend well beyond violin playing to singing, theater, and film acting. As a member of the Azusa Pacific University Chamber Singers, Ms. Sewell won first place for both Classical and Folk music in the 2013 International Choirs of the World Competition in Spittal an der Drau, Austria. As an actress, she has played leading stage roles at the performing arts festival Masterworks in Indiana and studied film acting at the John Kirby Studio in Los Angeles. Most recently, Ms. Sewell starred in the short film "Fantasy in D Minor" which will premier in 2018 at San Luis Obispo International Film Festival and at the Cannes International Short Film Corner in France.